Shellie Kendrick is the radiant beauty behind The Bald Bombshell who has created a community to celebrate feeling like you and wanting to look healthy while experiencing cancer through rocking the wig, fake eyelashes, and makeup. She has been diagnosed with cancer 3 times, the first as a 13 year old with non-hodkins lymphona and is now with Stage 4 of Meta Static Breast Cancer that has spread to her bones, liver, and lungs. Shellie shares her stories of perspective and acceptance that have come through the difficulties she has experienced from a young age. She tells of the power of the little things in her life as a teenager who found herself in the hospital alone- a book called “The Hiding Place” and a scripture written on a piece of paper left in a basket. She tells of the surprise of her second diagnosis of cancer and the resulting double mastectomy. Shellie shares of seeing her scar for the first time and the resulting cathartic episode of anger and anguish that became a crossroads for her to decide what she would do with her feelings moving forward. She tells how she hated that cancer had brought her to her knees but how it led her to God’s love and to her making changes in her life that had nothing to do with her health that prepared her for being diagnosed yet a third time. 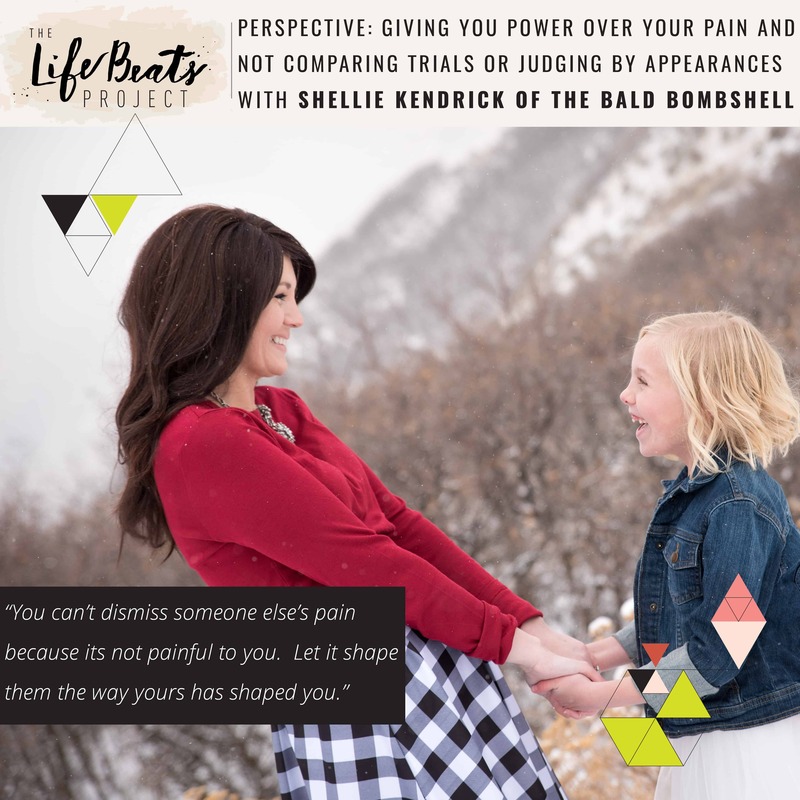 Shellie shares of how we can’t get caught up in comparing our trials or judging others because their pain is not painful to us. She tells of a story of being yelled after parking in a handicap space after spinal surgery because she was wearing a wig and appeared healthy and the importance of not judging by appearances, and how you can never assume anything about anyone because there is always something going on below the surface. Shellie shares the bright spot that her Instagram community has been for her to focus on other things besides progression, scans, and tumors and help others to learn how to feel like themselves during this difficult time by enjoying simple things like wigs, eyelashes, and makeup tips that will help them feel healthy. Listen and be inspired to allow those difficulties to shape us and keep up our hearts open to not judge or criticize others knowing that they are fighting an unseen battle as well. Want to know if this episode it for you? This episode is perfect for someone needing to see that their perspective can bring comfort and hope during times of difficulty. It is perfect for someone going through cancer or has a loved one suffering through cancer. It can be a comfort to those with cancer who want to feel free of shame by wearing a wig or dressing up. It is a good reminder to all of us that we can not judge by appearances and to remember to be kind to all, for everyone is fighting an unseen battle. the book “The Hiding Place” and how it helped her as a teenager to accept that there are hard things but that we can have perspective: will I let it harm me or help me? the story of being in Primary Children’s Hospital alone and going to meditation room with stained glass windows of angels and how the scripture someone left a scripture in the basket changed her life and helped her feel God’s promise.